Two housemates, two very different starts to life at Saints. Andy Symons and Andrew Kellaway moved in together after signing on at Franklin's Gardens during the summer and the pair have since become close friends. But their fortunes have been so contrasting with Kellaway going on to establish himself as a key man in the starting 15 while Symons has been forced to put his feet up. The former Gloucester man suffered a serious knee ligament injury during the first half of the defeat to Bath back in September and is set to miss the rest of the season. But Kellaway, who came on for Symons at The Rec, has gone from strength to strength, excelling across the back line, earning rave reviews in the process. You would think a feeling of envy might have hit Symons when he sees how well his housemate is doing while he is sitting on the sidelines. But that certainly doesn't seem to be the case. And Symons has actually been a huge help to his Australian friend, who arrived at Saints from the Waratahs. "It's a tough one," said Kellaway, who scored in the 36-17 win against Wasps at the Gardens last Saturday. "Like me, he (Symons) came in off the back of an injury and I think he was playing some good footy before he got injured so it's a real shame to see him go down. "But he's a funny guy, his sense of humour has been fantastic in helping me get through the games and giving me a little bit of insight here and there. "Obviously having been around the traps himself, that helps. "He's been fantastic for me as a mate and for my rugby." So with Symons able to get a different perspective on the match action, does he pass on tips to Kellaway when they are at home? "In bits and pieces," Kellaway said. "We try to keep the rugby outside of the house. "In fits and spurts we sort of talk it out and he's a fantastic bloke. "Having his company at home is pretty good." Kellaway has played in nine of Saints' 12 games in all competitions this season, scoring three tries in the process. And he said: "I'm loving it! "We're lucky we have a squad of pretty friendly blokes who have made life easy for me. "I'm enjoying it and I'm playing that way, too. "It's nice to be having a good time out there and let's hope we can keep it going. "I wasn't really sure how long it would take me to get back on my feet but everyone here has been fantastic in helping me get that sorted and feel welcome." 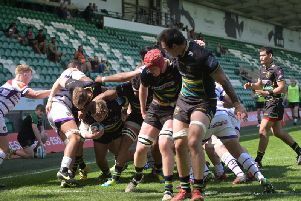 Kellaway only turned 23 last month, but he certainly wasn't the youngest member of Saints' back line last weekend, with the likes of James Grayson, Fraser Dingwall and George Furbank all involved. And the summer signing has been so impressed by players he hadn't heard much about before joining the club. "The young guys are awesome," he said. "Dingers is impressive and has been impressive all year, but someone I hadn't see a lot of is George Furbank and he's been outstanding so I'm looking forward to seeing more of him. "I've definitely been surprised how good they all are. "You hear about the guys like the Harry Mallinders and Cobus Reinachs and you know they're good, but it's the guys like Fraser Dingwall and Ollie Sleightholme who are the ones who have really impressed me." Saints' young guns will now look to fire again when they travel to Sale Sharks on Saturday. It is a fixture Kellaway has heard all about as his friend and former Saints centre Rob Horne gave him the lowdown before leaving England. "It was one of the bits of wise words that Horney passed on to me before he left," Kellaway explained. "He told me to enjoy that trip to Sale because it's a tough one. "It's going to be hard by all accounts. "But it's always nice to come off a win. We're full of confidence and ready for the next game. "Last weekend counts for nothing if we don't do the job this weekend and we're raring to go."